This easy chicken kabob recipe is a real win-win for your next party—it's like buffalo wings, but without all the mess! Chicken breasts are marinated in hot sauce, lime juice and spices and then grilled on skewers to create a finger-friendly appetizer option at your next game-day gathering. 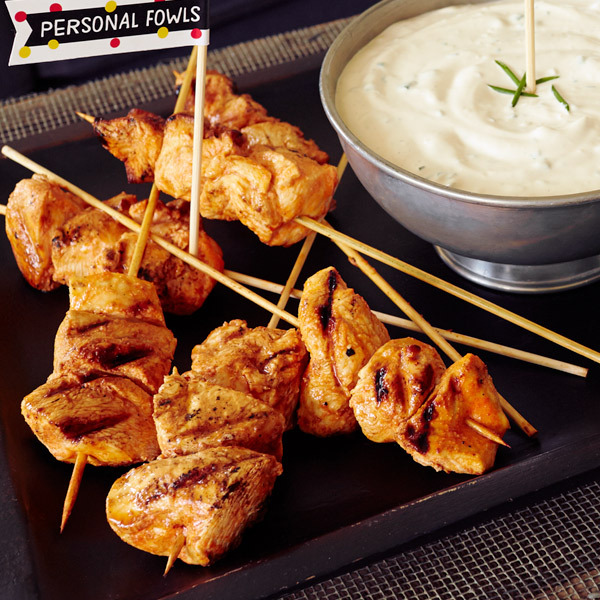 Score style points and flag these tasty buffalo chicken kabobs with our fun "Personal Fowls" football party printables and serve with our blue cheese dip. Combine the hot sauce, butter, lime, Worcestershire sauce, cayenne pepper and garlic and onion powders. Reserve ¼ of this mixture. Combine the chicken pieces with the rest of the marinade and marinate for 1 hour or longer. Thread 3 or 4 chicken pieces onto each wooden skewer. Then grill over medium high heat, 3 minutes per side or until no longer pink inside. Baste with additional sauce and serve with our blue cheese dip and celery stalks.